The foundation of our designs is the Floathouse shell itself, an extremely strong composite structure engineered to ignore the corrosive nature of saltwater and withstand wave action. See the shell only page for more information. A single floathouse would make a good home in a marina. This configuration can be purchased with our suggested floorplan. • Dockside commercial-space: office space, restaurants, shops, manufacturing, etc. See the Floathouse page for detailed information. 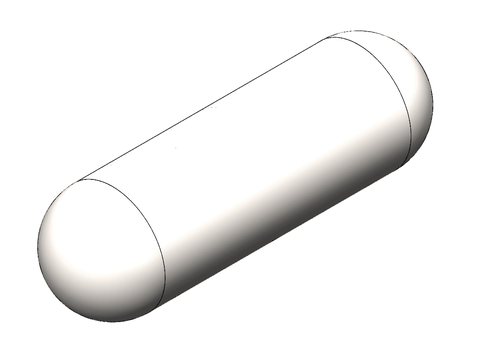 The Spar is a vertical Floathouse that has the advantage that it can remain extremely stable in high wave activity. 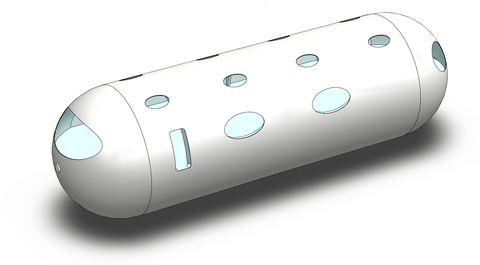 It is ideal for deep sea use and can function as a stand alone unit. The waterline is at the exterior ring. More info about this product on the Spar page. 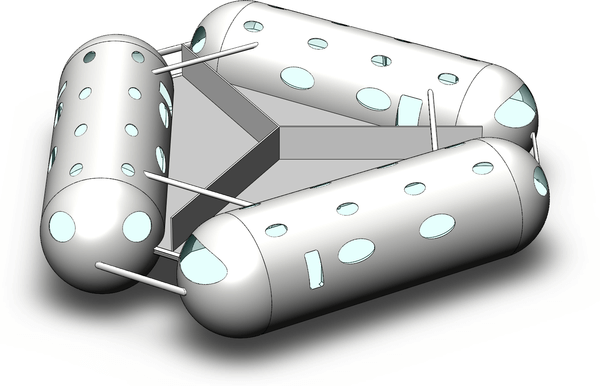 Two or more floathouses can be connected together using pantograph-technology and will be comfortable in medium wave activity and are designed to minimize tilting as a result of wave action. Visit the Maran page for more information. The Bermuda configuration is one of our favorite configurations. 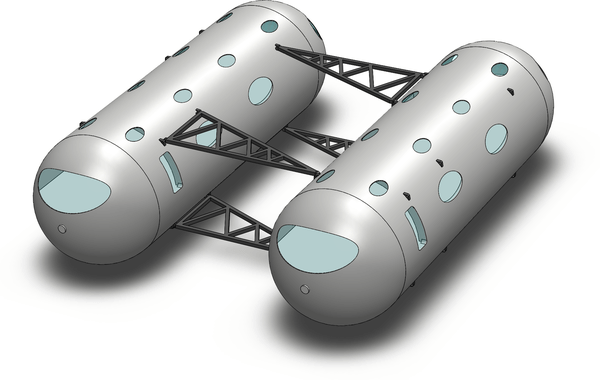 Three Floathouses connected in a triangle-shape create a very stable platform. It is a cost-effective way to obtain high stability in ocean-living. Checkout the Bermuda page for more details. An island allows you to start and grow a community at sea. Floathouses of various configurations can group together in town and city-size structures to accommodate thousands of residents and visitors. Modular city block-sized units can be arranged in scalable structures and moved around as the isle grows. Put a building over here, move it across the street tomorrow if you like. An island gives you enough marina and dock space, power-generation, facilities, networking equipment, and floating-breakwaters to create an independent city at sea, even hundreds of miles offshore. The island can be shipped to you anywhere in the world. The first island is currently in development. Checkout the Island page for more information.